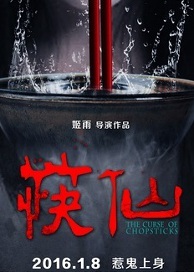 “Kuai Xian”, given the English title of “The Curse of the Chopsticks” is directed by Ji Yu. It begins with an attack on a patient who has just received a transplant at a private eye hospital, their new eyes mangled and a pair of bloody chopsticks left at the scene. This is one of many incidents, and rumours spread among the staff that someone is summoning spirits via Kuai Xian. Fingers point at Wang Jing (Zhu Xuan), the doctor who has operated on all the patients attacked. While the hospital struggles to maintain its reputation and order after angry patients resort to force and vandalism, Wang’s colleague and seemingly good friend Tian Jialu (Hu Jingyi), tries to help. As the story unravels we learn that Wang’s husband recently died in a car crash, that also left her very young step-daughter blind. She is shown praying devoutly to the gods for help to gain her daughter’s sight back. Tian notices something very strange about Wang’s household, and sneaks into her house at night. The film is based around the idea of traditional Chinese séance that uses a writing brush or pair of chopsticks, instead of an Ouija board, to summon the spirits. Despite its unfortunate choice of English title, the plot has considerable depth and employs subtle and complex means of expression, exploring perception from different perspectives, including madness. There is nice build up of suspense, terror, as well as the eerie – with devices such as cloaked figure and haunting nursery rhyme. Refreshingly, most of the special effects are achieved with props, costumes, camera work, change of music and construction of dreamscapes, rather than CG. A little more logic and fact checking could be applied to a few of the details of the story, and some of the character designs are a bit hackneyed, but still suitable, especially as the plot unwinds. It’s interesting to see a new ghost archetype emerge from recent works of Chinese horror, the longhaired, crimson lady or girl, usually a symbol of sacrifice, or an indication of a bloody death or bloody minded ghost. Two-thirds through the film, the plot takes a dramatic turn, and I was pleasantly surprised to find social commentary, having singled out the work out for its amusing title, expecting to find much gore or at best, a creepy tale. In fact, this film looks at contemporary social attitudes to parenting, attitudes towards girls and terminally ill children. It is also about motherhood in modern China and the relationship between mothers and daughters, portraying three mothers at very different points of the spectrum. The presentation of the film as a true story, and its ending sentence “mothers, where are you?” provide an indication that the kind of behaviour it examines, to different degrees, due to various social pressures, are a far more common occurrence than one would expect. A few years ago, when writing about Chinese horror, I pointed out that the recent relative social stability was beginning to allow China the luxury of exploring its past and its social issues through art, fiction and its blossoming pop culture. I’m delighted to see it doing so now.